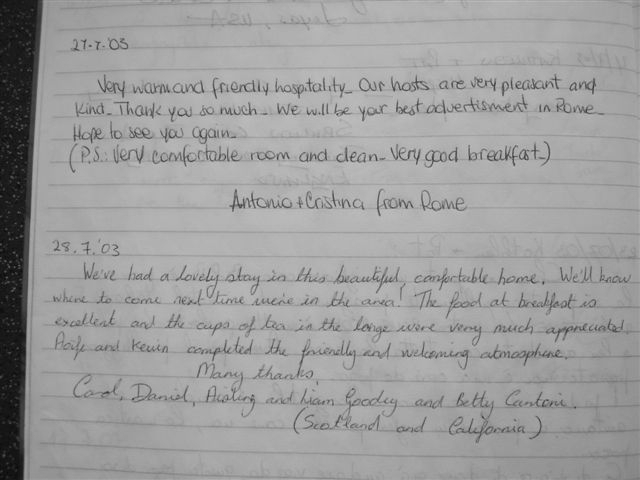 Many of our guests that stay at PK Lodge keep in touch with us. We have many guests who repeatedly come back and stay due to the wonderful hospitality and warm welcome that they have received. Below, and in the photo gallery section are a few of the letters of appreciation that have been sent to us. Very warm and friendly hospitiality.Our host was vey pleasant and kind. Thank you so much. We will be your very best advertisment in Rome. Hope to see you again. (PS Very comfortable room and clean. very good breakfast). It is possible for you to book PK lodge Bed and Breakfast Accommodation through our secure online booking facility on this website using the ‘Book Online Now’ facility and you will receive instant e-mail confirmation for your B&B booking. You are also welcome to contact the B&B directly by telephone or email or by clicking the contact us tab on the top of your page.